This is such an easy weeknight meal, but good enough to treat guest with too! With all the holiday parties and lists of things to do, it is nice to have a quick meal up your sleeves to cook when dinnertime rolls around. 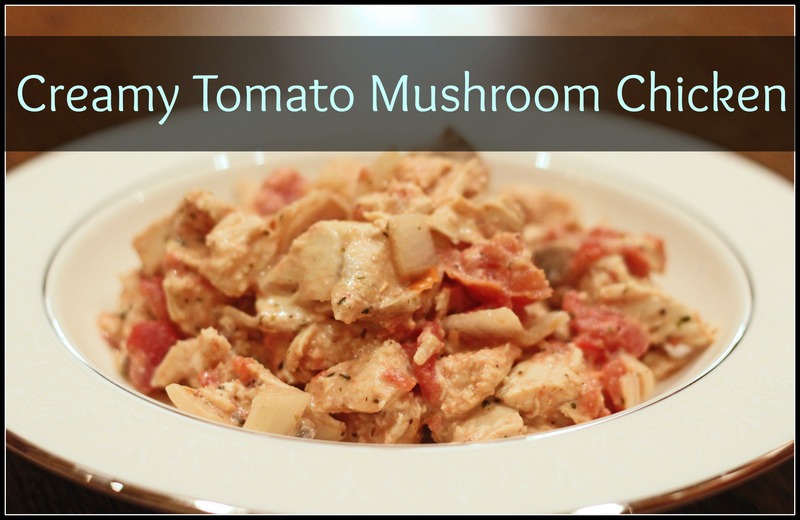 Creamy Tomato Mushroom Chicken is perfect with a low carb pasta like Dreamfields, or on top of cooked spaghetti squash. We even ate it alone with mixed low carb vegetables on the side. My husband loves mushrooms in anything. He is always wanting to add them to my dishes. This is the perfect dish for mushroom lovers! I hope you get the chance to try it soon! For Trim Healthy Mama’s: If you Use a low fat cream cheese as your base, with a can of tomatoes and white chicken breast, this meal can be fuel pull, satisfying or energizing depending on what you pair with it. It’s so flexible. Alone it is Fuel Pull – meaning low fat and low carb. An easy Fuel Pull dinner made in the skillet with tomatoes, chicken, and mushrooms. Heat skillet to medium high heat. Add coconut oil. Add chicken breast to pan. Continue to stir until cooked through. Add chopped mushrooms. Cook for 3 minutes. Add can of diced tomatoes. Once heated through, cut the cream cheese into small cubes and add to skillet. Serve alone with vegetables on the side, on top of cooked spaghetti squash, or on top of low carb pasta like Dreamfields. I am so glad you liked it! We like it too. One thing I love are easy meals that can come together quickly during the week. This is a good one for just that. I think I timed it at about 20 minutes which is as long as it takes to boil water and noodles and it has very few ingredients! My husband said I could put it in regular rotation which is a major win for me! We doubled it for our family of 8 who also need leftovers for the next day. That is so awesome! Feeding a family of 8 must be a challenge too. When you bake casseroles, do you do a standard 9×13 dish per meal or do you double? I’m just curious on my own, ha. This was amazing made it last night for a gathering of friends. I added a few things that I have for taste and I put cream of mushroom and cream of chicken. I didn’t use the cream cheese and it still came out creamy and delicious. Italian seasoning and garlic powder are my go to seasonings and really perked up the flavor. One of my new found favorites.